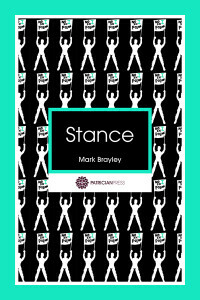 Mark Brayley is a poet and novelist and graduated from Essex University with an MA in Creative Writing in 2010. Having performed poetry for many years, he has a range of styles but has a particular predilection for the work of the French writing group OULIPO of which The Unfettered Cube is an example. Further examples can be found on the Genius or Not website created by Succour Magazine. Mark’s first full length novel, The Reluctant Understudy, is also due to be published. He is currently researching his second novel set in the jazz scene of Paris in 1952, and working on a poetry project involving translations of Viking poetry. 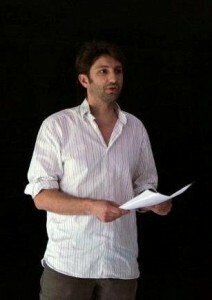 Mark runs poetry workshops at the Felixstowe Book Festival. 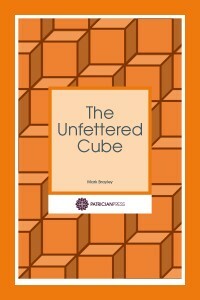 The Unfettered Cube had its inception in the spring of 2010. I had, at the time, been working on a great deal of Oulipian constraints. I had experimented with monovocalisms, lipograms, and rendered a new version of Raymond Queneau’s Cent Mille Milliards de Poèmes, as well as generating some new constraints of my own. In partnership with the Creative Writing Centre at the Department for Literature, Film, and Theatre Studies at Essex University, I decided to put on an exhibition, entitled The Workshop of Potential, in a local art gallery. The exhibition included large prints of predominantly visual Oulipian poems, with contributions from my fellow MA students, as well as other contributing artists. As part of my curatorial vision, I wanted a wall that showed a poem growing, thus showing the potential of the Oulipian style. The constraint of cubing numbers, was straight forward. The number of words in a line, lines in a stanza, and stanzas in a canto were directed by the cardinal integer. The size and shape of the poem was therefore set. One way of looking at it is that the constraint had formed a vessel or mould into which the raw material would be poured. The significance of cubing as a form of constraint was important because it gave the poem a symbolic third dimension. By bringing the poem off the printed page and into the art gallery, I wanted the work to interplay with the reader and the space that it was in. In that way it also makes demands of the reader to read aloud, to give the poem voice, to give it a further dimension. The other raw material came from two sources. Firstly, the numbers themselves offered symbolism which could not be ignored, for example Canto 9 is inspired by the nine muses, who were the offspring of Zeus and Mnemosyne. Secondly, I had the pleasure that spring and summer of a country retreat as I was house-sitting for friends. It was a warm spring and I spent most of it in a hammock writing poetry, surrounded by nature. I had intended the poem to finish with eleven cantos, with the last being 103. However, having experimented with the potential of manifold structures and alternative perceptual outcomes that came from my rendering of the Cent Mille Milliards de Poèmes, I realised that creating poems from zero to nine allowed the reader to then create any number larger than nine by simply reading the cantos in the relevant order. The beauty of OULIPO (Ouvroir de Littérature Potentielle) with the use of a mathematical formula is evocatively expressed in this imaginative, erudite and clever poem. Reading the cantos and interpreting the structure of the poem make it an entertainingly visual and interesting experience. Working within the constraint of the lipogram, Stance is a poetry collection completely constructed without the use of the letter i. Moving beyond the personal pronoun to be more objective, this collection delves through characters and narratives, as well as taking, at times, an imperative stance. 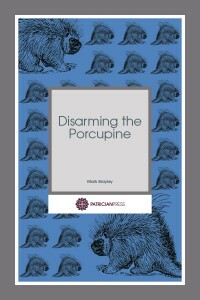 Blurring the boundaries between poetic catharsis, dramatic exploration of character, and challenging the reader, Disarming the Porcupine is a daring collection of poetry, spanning nearly ten years of writing. As a document of the mind of a man in the early twenty-first century, this is not poetry for the faint hearted.